If your looking to add a few more miles to your ride than this is a must have farkel. High-way pegs allow you to stretch out your legs and it helps prevent your knees from stiffening up. I had originally mentioned I would be making the pegs out of high strength aluminum. I changed my mind on that, the pegs themselves are still alum but the main support/connecting rods are steel. 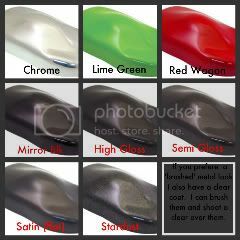 The hwy-pegs can be powder-coated in damn near any color you choose including clear coat or chrome Lips Sealed. I currently am using a gloss or a flat black. The pegs mount into a factory bolt hole. Remove the radiator support bolt and screw in the stud at the end of the pegs. You do have to do some modifying to the internal heat shields; but this is true of any high-way pegs you are installing. None of the 'internal' modifications can be seen from the outside nor does it affect the bike in anyway. The pegs are grooved and knurled for anti-slip protection. The Standard model requires no cutting of the fairing for 94 and up bikes. This pic is for demonstration purposes only. It is showing the mounting location for the Standard set. I can only presume that the Standard set would give the same amount of protection (not tested so i cannot guarantee this). As a plus for Snarf, I ordered the block off plates a little while back, they came in just a few days with good instructions, the pegs are next. And when his computer crashed he lost the records showing he had sent mine, he sent two emails confirming I had received them and if not he was going to send a set ASAP. Good retailer, great ethics, great products. I am 5 10 with 32 inch inseam.. Which one should I get? VC or regular?? Dan, I would venture to guess that the regular (standard) set would be just fine for you. To take any of the guess work out; put your bike on its center stand, stretch out your legs. If they COMFORTABLY extend past the the first louvered opening of the lower fairing then the standard set is OK for you. Well alright. They look even better on the bike LOL. I don't have any pics of the pegs mounted on somebody elses bike. Get'm on and post a few pics. Your bike will be famous. Going to try and send out money this week, need to get some before my June ride to the Dragon. Do you have a color preference? I just want to make sure I have what you want when your ready. EDIT: WOW I just noticed that I'm a Jr. Member. Now it's not such a financial risk. As an official Jr. Member I guarantee that you will enjoy the added comfort of the pegs many times over. Well, I guess its very safe to buy from the Jr. Member...that newbie status had me worried. Do you have green? I have some lime green on its way . What shade did you have in mind? Believe it or not, lime might work. I'll try and remember to post pics of the bike sometime. I will take a set of regulars snarf, sent ya a pm. Got it emailed ya back with a link for blue powders.